Wrapping up meat and three week with this cool, creamy salad just about sums up a good slaw. Some meals are just better with a side of crunchy, tangy slaw. I have never quite understood why some restaurants serve cole slaw in a small silver container on the side of your plate. It seems like an after thought and it’s usually not all that good. In a meat and three or barbecue joint, the cole slaw is a pretty important side dish. With just the right amount of crunch and zest, a good slaw can compliment an already great meal. I love cole slaw on a good barbecue sandwich or a spicy taco and cannot even imagine a basket of fried fish with out it. My version has a lot less mayo but still the same zip as a classic southern slaw. Combine yogurt, mayo, vinegar, sugar, celery salt and pepper in a small bowl. Gently toss dressing with slaw and chill at least 30 minutes before serving. Leftovers? Make some meatloaf sliders. 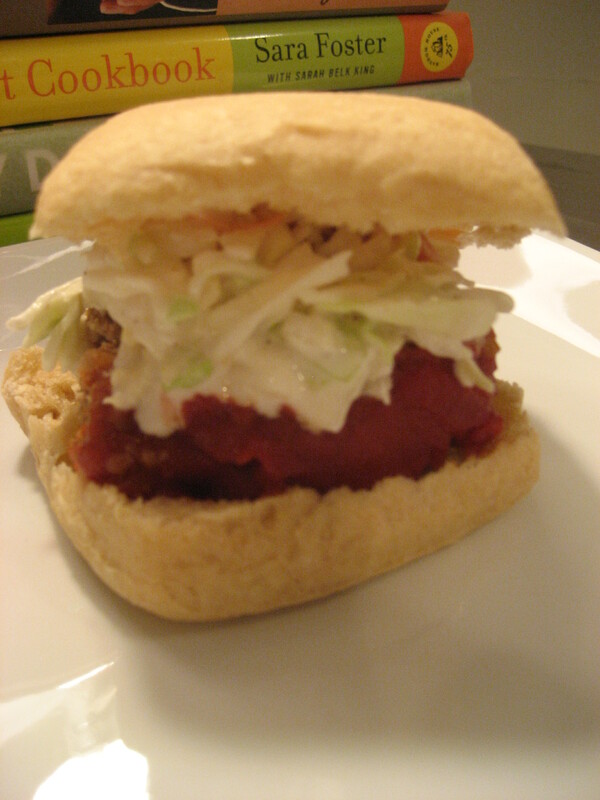 I use Sister Schubert’s wheat dinner rolls, top with meatloaf and spoonful of tangy slaw! This entry was posted in Side Dishes and tagged cole slaw, cooking, Fage, Food, Hellman's, meat and three, meatloaf, rolls, salad, Sister Schubert's, sliders, southern, tangy on February 4, 2011 by lolleigh.